A view of the ruins of the Iron Age city wall of Biblical Gath. Back in June, we talked about how archaeologists had identified a rare inscription from King David’s era, in the Valley of Elah west of Jerusalem (the very same valley were David supposedly fought Goliath). Well, this time around, researchers have made another significant discovery distantly relating to Goliath. 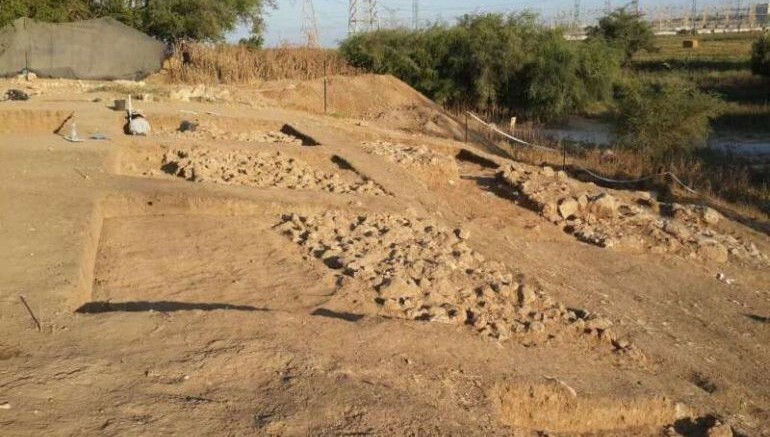 According to Ackerman Family Bar-Ilan University Expedition, they have come across the fortifications and entrance gate of the biblical city of Gath of the Philistines, the very home of Goliath, and quite probably the largest city in the area in around 10th century to 9th century BC. In fact, the settlement corresponds to the time of King Ahab who ruled in early 9th century BC, and is traditionally considered as the seventh King of Israel. The site in question is located in the Judean Foothills, in central Israel. And quite incredibly, the archaeologists were taken aback by the sheer scale of the settlement ruins. According to them, the entrance gate of the city is the largest ever found in Israel, and this gateway was accompanied by a series of imposing fortifications (including walls), a temple and even an ancient facility for production of iron. However, in spite of the defensive structures and the substantial layout of the settlement, the city was probably sacked and destroyed by Hazael, an Aramean king who ruled Aram-Damascus during late 9th century BC. In any case, the researchers were able to identify quite a few artifacts and structures that dates from around 11th century till 9th century BC. Among them, the archaeologists listed what appears to be the oldest decipherable Philistine inscription ever to be found (with two names that sound similar to Goliath), along with a bevy of objects that were related to the thriving Philistine culture of the time. Quite interestingly, the team also found ruins of later construction projects, including a siege system built by Hazael himself and the medieval Crusader castle of “Blanche Garde” which was visited by Richard the Lion-Hearted.